The Wyland Foundation held its 25th annual gala and fundraiser Nov. 10 at the Hyatt Regency in Newport Beach with approximately 225 attendees raising over $150,000, Steve Creech, Wyland Foundation vice president, said in an email. Climate scientist Dr. Ken Caldeira was the guest speaker. Robert Wyland first saw whales in the water off Laguna Beach during a family vacation in the 1970s. At 62, his latest conservation initiative, Wyland’s World Water Pledge, was made in partnership with UN Environment. 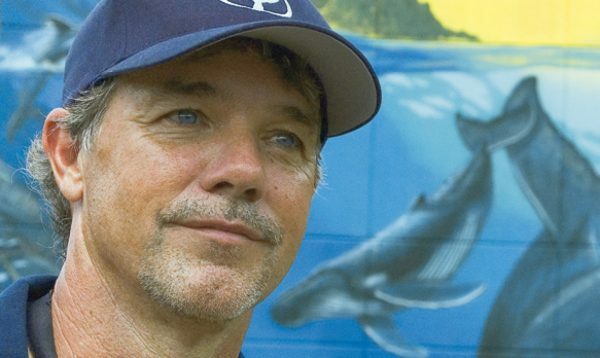 Robert Wyland, who describes himself as a marine life artist and goes by only his last name, first saw whales in the water off Laguna Beach during a family vacation in the 1970s. Upon returning to his native Detroit, he switched from drawing dinosaurs to whales and won a scholarship at the Center for Creative Studies in Detroit, where he majored in sculpture. In 1977, he moved to Laguna Beach and the following year opened a studio. In 1979, he was named Sawdust artist of the year. In July of 1981, at 25, Wyland completed his first grand-scale mural of a gray whale mother and calf on the wall of the building that is now his live-work gallery on South Coast Highway. His thought was that if people could see the mammals life sized, he would garner more support to protect them. He pledged to paint 100 murals of monumental scale. The goal was accomplished in 2008 when “Hands Across the Oceans,” a 24,000-square-foot, half-mile-long series of canvas murals created with student artists from 110 countries, was displayed at the National Mall in Washington, D.C. The Nov. 10 gala featured live painting by Wyland, an auction and a retrospective of notable foundation programs and accomplishments. “The basic idea with everything we do is that we can’t protectone body of water without thinking about the next,” Wyland said. Accomplishments by the Foundation along with partner organizations ,in the last year touted at the gala included encouraging people across the nation to make more than 600,000 water conservation pledges through the National Mayor’s Challenge, educating over 30,000 children with the mobile learning center and donating art supplies to schools in 100 cities. “All these programs tie together art, science, and action for clean water and a healthy ocean, just as I hoped they would from the very beginning,” Wyland said. At 62, Wyland’s zeal continues to grow. The latest initiative, Wyland’s World Water Pledge, was made in partnership with UN Environment. “It’s a series of conservation actions that people anywhere can take that have global impacts for clean water and healthy oceans,” Creech said. “It’s meant to engage every citizen in every country on the planet to take one minute and learn how they can conserve our precious water; without water there is no life,” Wyland added. The more than half dozen programs run by the Wyland Foundation also include awards for outstanding teachers and nonprofit groups and the National Art and Mural Challenge, where students learn about issues such as eutrophication and make a mural with the artist. Creech credits the Wyland team, staff, volunteers and board members for making the Wyland organization what it is. As reported to Guidestar, the organization that tracks nonprofits, the Wyland foundation listed $593,221 in assets in 2016, the most recent report available. 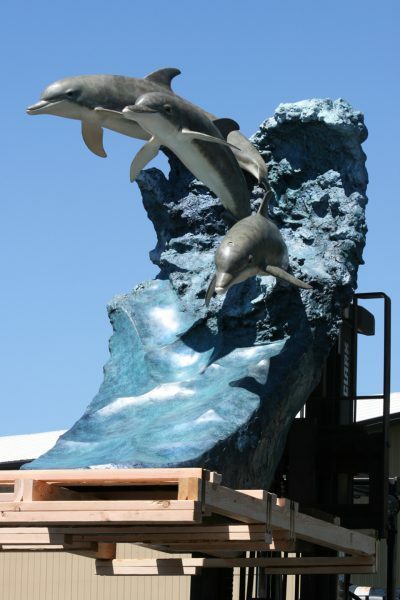 Wyland’s “Faster, Higher, Stronger” monument is a likeness of three dolphins and was made to raise money for the 2008 Olympics. It was installed in the Beijing International Sculpture Park. The artist’s current self-imposed challenge is to create 100 monumental sculptures with water elements for 100 cities over the next 25 years. “In the beginning I couldn’t afford to cast my sculptures so I focused on my paintings,” Wyland said. He also envisions 10 of the one hundred sculptures as underwater monuments. Each sculpture will be officially dedicated and made from recycled bronze, stainless steel or aluminum. The first one, “Faster, Higher, Stronger” (the International Olympics Committee motto) is a likeness of three dolphins and was made to raise money for the 2008 Olympics. It has been installed in the Beijing International Sculpture Park.